Our cycle tour of Turkey gave us the opportunity to visit some of the more famous tourist destinations. Checkout the albums from each place. 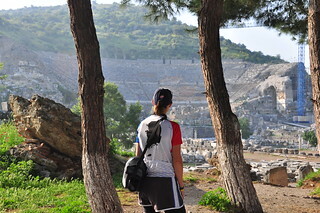 Ephesus (Efes in Turkish) was an ancient Greek city, and later a major Roman city, on the west coast of Asia Minor, near present-day Selcuk, Turkey. It was one of the twelve cities of the Ionian League during the Classical Greek era. In the Roman period, Ephesus had a population of more than 250,000 in the 1st century BC, which also made it one of the largest cities in the Mediterranean world. 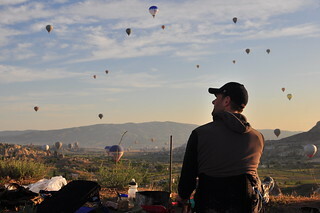 We woke up at 5am every morning to watch the hot air balloons set up and fly over the small town of Goreme. Spectacular views, amazing scenery, and some damn good turkish coffee. Cappadocia is known around the world as one of the best places to fly with hot air balloons. The spectacular surrealistic landscapes combined with excellent flying conditions allow the balloons to gently drift over and between fairy chimneys, pigeon houses hewn into the unique rock formations. 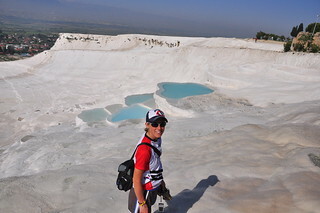 Our 3rd tourist stop while cycle touring Turkey was the Pamukkale Travertines. Located in Turkey’s Inner Aegean region The Pamukkale Travertines are terraces of carbonate minerals left by the flowing water. We arrived first thing in the morning with the sun low. It made the pools look so much more blue. We did a bunch of hiking during our time off the bike throughout the stunning valleys of Goreme National Park. Cappadocia is famous for magnificent valleys and unique formations shaped by the eruptions of three volcanoes. 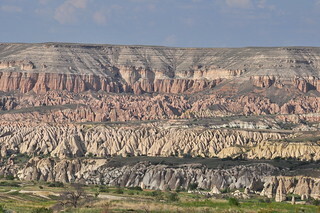 The valleys were used to hide the first churches of Cappadocia carved into fairy chimneys and caves.